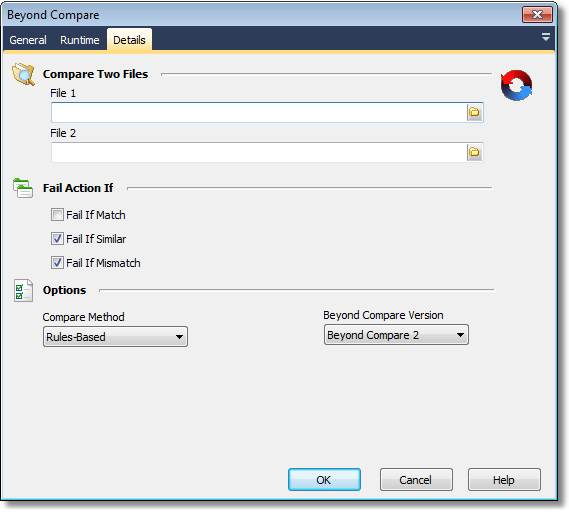 The Beyond Compare uses the QuickCompare mode of Scooter Software's Beyond Compare to compare the contents of two files. Specify the path to each file. The action can be set to fail on any combination of matching, similar and mismatched files. Comparisons can be made based on rules-based, size, CRC or full binary comparison. See the Beyond Compare help file for the details of each comparison method.